On Saturday, September 17, at 1:30 pm at The Behnke Nurseries in Beltsville, Lee Linett will be keeping with the show's theme of Gesneriads on Broadway and giving the talk "A Mix For All Seasons," discussing basic potting mixes for gesneriads. Lee has a long history with gesneriads. She has been growing plants indoors under lights for several decades, taught courses for the USDA Graduate School on growing plants indoors under lights, has volunteered for more than five years at the Smithsonian Institution's botany department, and authored numerous plant-related articles for various publications. 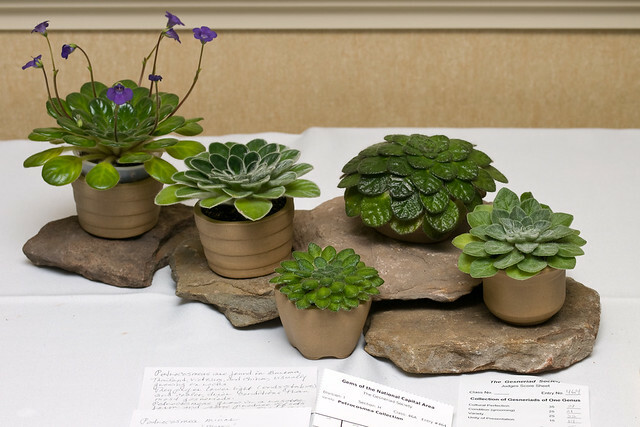 Petrocosmea collection exhibited by Lee Linett at The Gesneriad Society's 2009 Convention. She has served two terms as president of the American Gloxinia & Gesneriad Society (which is now The Gesneriad Society); was a national convention chair for 14 years; and has held awards chair, director, archives chair, convention judges chair, and Nominating Committee positions. Lee has also served as the assistant editor for the Gloxinian, The Gesneriad Society's predecessor to the Gesneriads journal. Her service to The Gesneriad Society has been recognized with an Award of Appreciation. Lee has also been highly involved in the NCAC chapter as a founding member, past president, editor of the newsletter version of Petal Tones, and local convention chair (twice). She is currently the Hospitality Chair for the chapter. Her favorite gesneriads are Drymonia, Episcia, and Columnea of the former Dalbergaria types.